"New feathered T. rex relative discovered in China"
One of the coolest things about yutyrannus isn't just the feathers, but those hornlettes and big arms are epic. And I love the colouration. actually, there's no direct evidence. That patch of filaments most probably is from the belly as I suggested someday in the FB post. Oh, I didn't know that. Thanks for the info! So it wasn't a tyrannosaur or was it early enough to not have developed that trait or was it a proceratosaur or a megalosaur? I saw this on a Trey the Explainer video. He forgot that dinosaurs with feathers couldn't be very big, flashed your picture on the screen, and remembered. 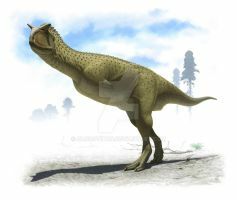 this dinosaur has feathers like birds,and feet and claws like a dinosaur,and a tail like a cat. What a mix! 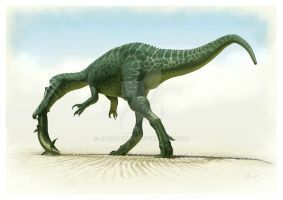 I like Yutyrannus' second name: huali (I always say it "hoo-aaaaaaalie"). 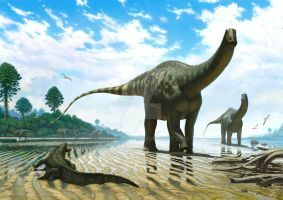 Great picture but my favourite of this artist is Eoabelisaurus mefi. I'd love to see a movie where yutyrannus was the main character. One of the best reconstructions of the recently-discovered Chinese tyrannosauroid that I've seen. I would also like to see it in its environment soon sometime as well, such as a forest habitat. Great interpretation of yutyrannus. I would love to see this in a full environment at some point, as your previous attempts at that have been quite successful. Is this a tyrannosaurid? COOL pic! Seen a lot of pictures of Yutyrannus, this is among the best, great work! So Yutyrannus is clearly a new species, cus I've been seeing ALOT lately. So this is the new animal that's on the news? I like the colours you chose for it. In the last days has been upload to DA interesting pieces about this dinosaur - Yours is not the exception, of course, but is my favorite between all. So was this from high altitudes? One of the best reconstructions I've seen yet. Awesome ! Yeah some background would be great ! Андрей отличный тиранозаврид. работа как всегда бесподобна. This is great! I was just looking for images of Yutyrannus today. I knew I should have started with Deviantart. Nice job - as expected!